Originally uploaded by Mark Bruko. Writing about music is so easy. I’ll find myself listening to something and I feel like I have to blog about the music. And that’s all there is too it. We’ve been listening a lot to The Veils lately. I first heard this band on Radio Paradise three weeks ago. They have two records, both of which are on Rhapsody. So we got into them right away and they’ve been in very heavy rotation in our house since then. The first record is The Runaway Found and the new release is called Nux Vomica. I first got into Runway Found with songs like Lavinia and The Leavers Dance. I listened on Rhapsody and Yottamusic over and over. But I recently bought the Nux Vomica record on eMusic and so I’ve had it on my iPod. And because I’ve been on a lot of planes and car rides recently, Nux Vomica has risen to the top of the playlist. It’s a fantastic record. The song that first convinced me about this band, Jesus For The Jugular, is on this record. Other favorites are Advice For Young Mothers To Be and the ending track, Night Thoughts Of A Tired Surgeon, which sounds like it belongs on Strangeways Here We Come (The Smiths for those of you who never went through the Morrisey phase). 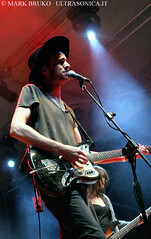 The Veils are from New Zealand and the lead singer, Finn Andrews, is known for being intense on stage. I learned all this from Wikipedia, so it could be completely false, but I rely on it anyway. The Veils are coming to Bowery Ballroom on Sept 10th. Tickets are on Ticketweb. I bought four this morning at the very reasonable price of $13 each and hope to be there to see if Wikipedia is correct.